Meditating upon these aspects of thiruvEngadamudaiyAn who is the refuge, AzhwAr performs proper and complete surrender towards him and completes this decad. In the previous decad – AzhwAr explained the nature of the goal perfectly; in this decad, he explains the nature of the means perfectly; though there is discussion about the means in previous decad, the discussion about the goal is prominent in that; though there is discussion about the goal in this decad, discussion about the means is prominent. Previous decad is like thirumanthram [which emphasises the goal] and this decad is like charama SlOkam [which emphasises the means]. But aren’t both the means and the goal present in one [bhagavAn] [why highlight separately]? Yes – that is by his potency [he remains both the means and the goal]. But since both are individual states, they are to be highlighted individually only. AzhwAr became very depressed since emperumAn who is the protector of all, did not arrive even after AzhwAr cried loudly to be heard in paramapadham, with great sorrow. emperumAn is Sriya:pathi (lord of SrI mahAlakshmi), with no unfulfilled desires, with both [material and spiritual] realms as his wealth, with all auspicious qualities. 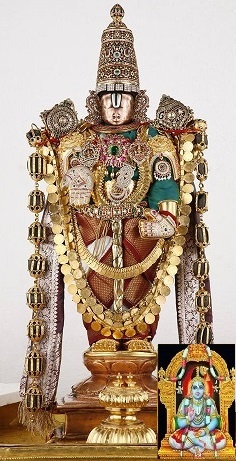 As said in linga purANam “vaikuNtEthu parElOkE SriyA sArdham jagathpathi: AsthE vishNurachinthyAthmA bhakthai: bhAgavathaissaha’ (In the most noble abode of vaikuNtam the lord of the world is present with SrIdhEvi nAchchiyAr; such vishNu is present there with devotees and followers) – sarvESvara while being in SrIvaikuNtam giving his audience to nithyasUris, thought “We should not be staying far away so that we are unreachable by many [in the material realm]” and mercifully incarnated as SrI rAma, krishNa et al and manifested his qualities and activities to those people who lived in those times. He also descended to thirumalA along with his consorts, for the benefit of the samsAris who are subsequent to the times of SrI rAma, krishNa et al, as the one who creates the taste [towards him] in them. Seeing that there is no restrictions based on the adhikAri (individual’s nature), kAlam (krutha yuga etc) and anga (ancillary steps before worshipping), and the sauSeelyam (simplicity) which makes emperumAn accessible easily, AzhwAr approaches thiruvEngadamudaiyAn through periya pirAttiyAr, highlights his own ananyagathithvam (lack of any other refuge) and surrenders unto emperumAn‘s divine feet and informs his firm faith. Even previously AzhwAr performed prapaththi (surrender) in many places; on those occasions as per the rule of “wherever the entity is, his qualities will follow”, lakshmI’s presence was highlighted; here, AzhwAr is expressing the same explicitly. Previous acts of surrender are like thirumanthram [where SrI mahAlakshmi’s name is not explicitly present]; this surrender is like dhvayam [where SrI mahAlakshmi’s name is explicitly present]. Though emperumAn’s relationship with SrI mahAlakshmi is known through the meaning of the words in thirumanthram, it is only in dhvayam that this is explained explicitly; this decad is similar to that. [The different types of persons who surrender are explained here] SrIvishNu purANam “thAvadhArthis thathA vAnchA thAvan mOhas thathAsukham” [SlOkam is explained here. This SlOkam is similar to SrI bhagavath gIthA 7.16]; thAvadhArthi: – Only goal is to redeem lost wealth; thathAvAnchA – Only desire is to attain inapt objects; thAvan mOha: – considering body and soul to be same; thathAsukham – Only those pleasures which are contradictory to that which is explained in thaiththirIya upanishath Anandhavalli 7 “EshahyEvAnandhayAthi” (he – emperumAn – himself makes jIvAthmA ecstatic). “yAvannayAthi SaraNam thvAmaSEshAganASanam” – aiSvaryam (worldly wealth), kaivalyam (eternal self-enjoyment) and hurdles for attaining kainkaryam to bhagavAn will all remain only until bhagavAn is reached. In this manner, AzhwAr considers that all his hurdles are removed and there is no shortcoming in having all his desires fulfilled, surrenders at the divine feet of thiruvEngadamudaiyAn who is always present. Now, for surrender to fructify, one should surrender to the one who is the true refuge [emperumAn being the refuge is explained by “ulagam uNda peru vAyA” etc]; one should also be qualified to surrender [AzhwAr being properly qualified person to surrender is explained by “kula thol adiyEn” etc]. When surrendered to an unqualified person, it would even lead to slaying of the one who surrenders [when dhaSaratha surrendered to paraSurAma, paraSurAma’s anger did not decrease but only increased]. This being the case, as we see the act of surrendering being successful in some cases [like the pigeon being protected by emperor Sibi, hunter being protected by pigeon and so on], it is obvious that AzhwAr‘s surrender is successful here. Now, for the one who surrenders, he/she should also be truly having no other refuge; while surrendering, if it is not successful, one cannot say as [SrI rAma said] in SrI rAmAyaNam yudhdha kANdam 21.20 “asamartham vijAnAthi” (This [king of] ocean is treating my patience as inability) [Such persons are not qualified to perform surrender. So, persons like AzhwArs are the real adhikAris for surrender]. As emperumAn blessed AzhwAr with unblemished knowledge and devotion, subsequently [when his desire to reach emperumAn was not fulfilled immediately], he performed madal [madal is the activity of crying out in public for a person to be accepted by him] so that emperumAn will himself fulfil the desire. When the result is delayed, if one can seek other refuges, the surrender will not work for such persons [like AzhwArs, one has to go to emperumAn only even in case of delays]. As seen in SrI rAmAyaNam yudhdha kANdam 21-22 “sAgaram SOshayishyAmi padhbhyAm yAnthu plavangamA:” (I shall dry up the ocean. The army of monkeys can walk through the ocean bed), considering the ocean king’s delay as the reason, SrI rAma said “I will destroy the entity named water and will work with the other four elements” [such persons do not qualify to perform surrender]. SrI rAmAyaNam yudhdha kANdam 21.20 is further explained here. kshamayA hi samA yuktham – The [monkey] elders were puzzled at SrI rAma thinking “He showed patience towards kaikEyi who took away his kingdom; but here he prayed to varuNa to cross the ocean and when he did not oblige, he became angry and started launching his arrow on the bow [started binding varuNa’s hands and legs]. Why is it like this?” (There is place for his mercy, but in this case it is not applicable.) [kaikEyi was simply desirous of her son ruling the kingdom and did not think SrI rAma as incapable, but ocean king considered SrI rAma to be incapable]. My anger was subdued by my patience [initially] when he did not come just as thArA surrendered to vAli and subdued him initially from killing sugrIva. mAm – as said in “supthamaththakupithAnAm svabhAva gyAnam dhrushtam” (Subsequent to sleeping, becoming mad and being angry, one will realise his true self), after being angered, he [SrI rAma] realised his heritage. He (varuNa) does not know that I [SrI rAma] am coming from a famous lineage, which does not seek help from others; he does not know that I am the son of dhaSaratha (suptha … – those who hid their nature, will reveal the same in dream state; SrI rAma too realised his regal heritage). ayam – varuNa was thinking about the vastness of the ocean considering it to be a mahOdhadhi (great ocean); he does not realise who is angry at him. makarAlaya: – He (varuNa) is thinking himself to be on a par with the emperor of ayOdhyA, kOsalA etc; he does not realise that it is just a fish pond. asamartham vijAnAthi – He does not realise that “I have reformed even those who were dishonest, and engaged them in service”. dhikkshamAm – Now I don’t need patience. Should it not be used where it is applicable? Just like anger, I would put it to use when the time is right. How can a descendant of ikshvAku dynasty not show compassion? IdhrusEjanE – What is the use of it? Patience is not applicable here. For this ocean, the connection with rAvaNa et al on the other side has caused it to acquire their qualities. While AzhwAr explains the qualities of emperumAn who is the SaraNya (refuge) in the first nine pAsurams, he surrenders in the tenth pAsuram. This entry was posted in thiruvAimozhi, thiruvAimozhi 6th centum on June 12, 2018 by Sarathy Thothathri.